EPA will not set a legal limit for two PFAS chemicals in drinking water, angering environmentalists and lawmakers. An EPA spokeswoman did not deny a report from Politico, citing unnamed sources, about the expected action but said a PFAS-related plan is "currently undergoing interagency review." "EPA will be prepared to discuss the contents of the plan as soon as interagency review is complete, and the plan is public," the spokeswoman said in a statement. Per- and polyfluoroalkyl substances, or PFAS, are a family of thousands of chemicals that have been used in products ranging from nonstick cookware to firefighting foam. Health effects of exposure may include increased risk of cancer and problems with growth, learning and behavior in infants and children. The two chemicals that apparently won't be regulated — PFOA and PFOS — have been linked to kidney and testicular cancer. Without limits under the Safe Drinking Water Act, utilities would not be required to test for the chemicals and make sure they aren't present in what people drink. "If these sources are right, the EPA is essentially telling the more than 110 million Americans whose water is likely contaminated with PFAS: 'Drink up, folks,'" said Environmental Working Group senior scientist David Andrews. More than 1,500 drinking water systems across the country could be contaminated with the chemicals, according to EWG research. "It is absolutely unconscionable for the Trump administration to refuse to even start the process of setting a limit on these poisonous chemicals," said Erik Olson, the Natural Resources Defense Council's senior director for health and food. The decision, if EPA stays the course, may lead to action on Capitol Hill, where lawmakers on both sides of the aisle have been pressing the agency to address PFAS. Last week, while launching a bipartisan PFAS Task Force, several lawmakers talked about bills to introduce. If EPA, as reported, is declining to strictly regulate PFAS, those measures could soon emerge. "I am currently pushing legislation, as well as with others, that would add to the Safe Drinking Water Act an enforceable standard for PFOS," said Rep. Brendan Boyle (D-Pa.), referring to a type of PFAS that industry phased out of production in 2015. "It's kind of hard to believe, but the standard that is there now is voluntary and any cleanup that happens is voluntary," he said. Rep. Dan Kildee (D-Mich.), the task force's co-chairman, added that "virtually all of the legislation that many of us had introduced in the last session either is being introduced or already has been introduced." Kildee is currently co-sponsoring H.R. 535, from Rep. Debbie Dingell (D-Mich.), which calls for EPA to designate PFAS as hazardous substances under the Superfund law. The agency would reportedly do that for some — but not all — types of PFAS. H.R. 6835, which sought to make it easier for federal agencies to work with states on addressing PFAS contamination. H.R. 7284, which would have required a nationwide survey of perfluorinated compounds. H.R. 6993, which aimed to provide additional services to veterans exposed to PFAS on military bases. When it comes to oversight of EPA, Dingell announced at the task force launch that the Energy and Commerce Committee she serves on was planning a hearing devoted to PFAS (E&E Daily, Jan. 24). EPA's actions on PFAS could complicate the confirmation of acting EPA Administrator Andrew Wheeler, nominated to lead the agency on a permanent basis, and Peter Wright, Trump's pick to lead the solid waste office. Work that Michael Dourson, a failed nominee to lead EPA's chemicals efforts, did on PFAS led North Carolina's two Republican senators to break ranks in 2017 and effectively derail his confirmation (Greenwire, March 20, 2018). 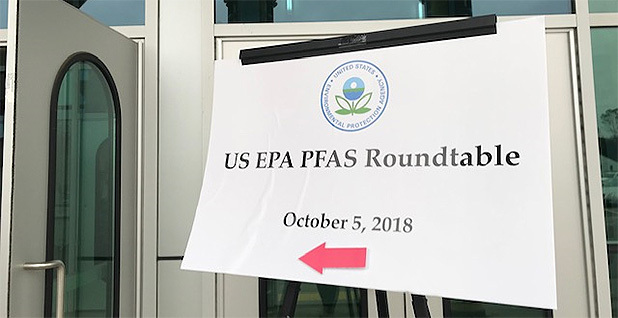 After Dourson's defeat, EPA attempted to get out in front of the PFAS issue. It held a summit with state regulators and made a series of regulatory commitments. Now, deadlines for those promises are fast approaching or have already passed (Greenwire, May 22, 2018).